Welcome to Mesa, Arizona. A gateway to one of the most dynamic regions in the country. A gateway to discovery and adventure – A to Z. Throughout our history and now a city on the move, Mesa is about limitless possibilities and opportunities for all visitors. A city that knows no bounds: from urban to rural, mountain peak to desert floor, arts and culture to sports and immeasurable outdoor recreation. Mesa sits at the heart of a geographic wonderland. Close to the Tonto National Forest and the iconic Superstition Mountains but far enough to experience the wide-open and true Arizona vacation. Each and every guest is given unparalleled access to one of the richest arrays of visitor offerings in the country. From Farm to Fork dining options, Western shopping and local Native Artist shows to headlining live performances. Mesa may be off-Broadway, but we’re firmly on the country’s arts and culture maps. From here, all things are possible. Timeless. Boundless. Fearless. Mesa is sure to show you why we are City Limitless. 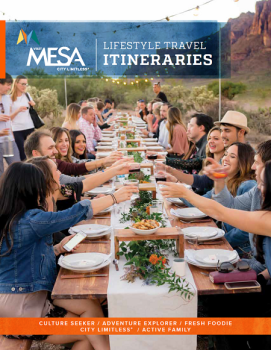 Download the complete 2018 Visit Mesa Itinerary HERE. Traveling with tots? Mesa has you covered. Whether creating a work of art, panning for gold, or feeling your way through a dark cave, Mesa offers an enriching experience for every family. Mesa is recognized nationally as offering one of the most family-friendly communities for residents. In fact, the city most recently made the annual "Playful City USA" list by KaBOOM!, a national non-profit organization dedicated to bringing play into children&apos;s lives. Such distinctions bode well for travelers seeking out unique and different ways to keep children entertained and engaged on vacation. Year-round, Mesa attractions offer interaction both indoors and out at museums, play centers, parks, shopping centers and more. Whether your child seeks out an action-packed adventure, or more a laid-back affair, families have countless options to make memories in the Sonoran Desert. And, just because you have kids in tow doesn&apos;t mean dining is relegated to fast food and take-out. Rather, Mesa&apos;s kid-friendly restaurants cater to tykes and teens, ensuring all appetites are satisfied - often with a dash of entertainment added to the mix! In Mesa, our bountiful harvest is one that we proudly share with our visitors. Fresh experiences and a treasured heritage of family farms and long-standing festivals make for lasting memories. Mesa serves as a culinary gateway to Greater Phoenix, with the region’s neighboring farms providing a continuous bounty of seasonal goods for visitors to enjoy at restaurants and resorts throughout Arizona. The agri-tourism experiences that are unique to Mesa keep visitors coming back for more. Discover the Fresh Foodie trail NOW. Located in the Sonoran Desert, Mesa is surrounded by a rich, vibrant and verdant playground for sought-after outdoor recreation. Within minutes from our collection of resorts and hotels, guests can immerse themselves into a legendary landscape – a region full of intrigue and awe that continues to inspire and amaze our visitors every day. From hiking mountain tops to kayaking along calm rivers and canyon-carved lakes, nearly every outdoor pursuit can be experienced here in the Sonoran Desert. As a city for good sports, Mesa is in the heart of a recreation paradise. Mesa visitors can take advantage of being close to the Tonto National Forest - the fifth largest and one of the most visited "urban" forests in the country. There are three lakes and two rivers just outside of Mesa that allow for every water sport imaginable. Pair that with the breathtaking Superstition Mountains to the east and you have an incredible gateway to adventure. For those wanting to stay close to home base, Mesa also boasts ample indoor sporting activities from simulated golf, laser tag and rock climbing to indoor kart racing. Mesa hosts numerous sports competitions and championship events at all levels and has been recognized nationally as one of the top cities for tournaments in the Southwest by readers of Sports Events magazine. Pack your clubs and hit the links in Mesa for some of the best golf in the Southwest. Mesa is home to renowned courses featuring breathtaking views of sweeping vistas set against the natural beauty of rugged mountains and blue western skies. More than 40 golf courses are within a half-hour drive of Mesa&apos;s downtown core offering a variety of options from challenging desert golf to traditional links play. And, baseball fans can attend Cactus League Spring Training baseball games with the Chicago Cubs at Sloan Park and the Oakland Athletic’s at Hohokam Stadium each spring. No matter what sport or recreational pursuit you crave, chances are you can find it in Mesa. Few Southwest cities have the breadth of arts and cultural experiences as Mesa, Arizona. In fact, when visitors stroll our unique, tucked-away districts that make up the city&apos;s downtown core they soon realize the dedication to the arts when they see the numerous cultural offerings including the award-winning Mesa Arts Center. The center is the largest and most comprehensive performing arts, visual arts, and arts education facility in Arizona and reflects the city&apos;s rich tradition of family, community and pride. An inviting oasis by day and a luminous beacon by night, this central gathering place is designed to showcase a world of arts and culture. Don&apos;t miss the five-gallery visual arts complex, Mesa Contemporary Arts, on the arts center campus and check out a performance while visiting at one of their four theatres. Visitors to Downtown Mesa can watch for more than 40 public art sculptures lining Main Street, along with a collection of eclectic art galleries and artist studios. At the Arizona Museum of Natural History mastodons and dinosaurs roam the halls with changing exhibition galleries offering a variety of interesting subjects from the natural world. And, don&apos;t forget to take the kids to a new universe of imagination and creativity at i.d.e.a. Museum.